Although textile artist Sara Ashford meticulously paints fabric with flowing lines and shapes, she also always has an experiment brewing. Sometimes it’s pieces of linen or silk wrapped around a pole and tied with string; other times, the fabric may be buried in compost or onion skins. 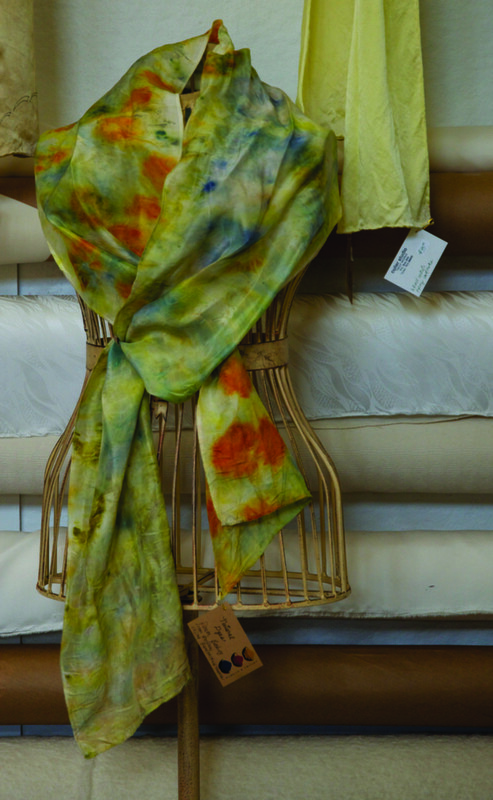 Recently she has taken to cooking up wild mushrooms and lichens to use as dyes. These experiments in art and science create a fertile canvas of exquisite patterns and colors that Ashford highlights with delicate drawings. “Some of it is just beautifully random, and that always excites me,” she said. “It’s pure pigment, not dye. It’s essentially fancy dirt,” she said. In her TwispWorks studio, Ashford is literally surrounded by endless possibilities for inspiration. Her diaphanous dyed and painted silks float on hangers, scarves and shawls are draped on mannequins, and luscious skeins of hand-dyed yarn spill out of baskets. Glass vials containing vibrant powdered pigments are arranged on shelves. Other tools of the trade include bristly Japanese brushes for applying soy milk, and wispy ones for painting with pigments. Ashford mixes the pigment in delicate ceramic bowls m ade by her husband, Don. Plastic bins are stuffed with pieces of linen, bamboo, silk and rayon that have been dyed, silk-screened, or printed with woodblocks. Many of these pieces are still works in progress but, as Ashford goes through them, she becomes animated by areas of gorgeous color or unexpected shapes. In the studio’s large kitchen, indigo cures in large cauldrons below shelves lined with jars of dried flowers. Plastic baggies contain labeled color samples—bits of fleece stained with osage orange or red cochineal. Another room contains several looms threaded for weaving. Going through the dyed and painted fabrics, Ashford looks for shapes and color—and the spaces between them—which she outlines with an archival pen or a delicate brush with earth pigments. “Once I start drawing, I totally focus—I feel centered and grounded,” she said. Ashford has always filled sketchbooks with her drawings, but in the past several years she has found a way to combine her passion for drawing with her textile art. Virtually every piece of fabric is a building block for a larger project. Pieces that don’t completely succeed may be cut into strips and woven into a scarf. In college Ashford took every art class offered, but it was years before she discovered textile art. In the ceramics studio, she found herself making flat pieces. “I wasn’t as 3D as I thought I might be,” she said. She began dabbling in the fabric arts after Don bought her a spinning wheel. They had two young children, and spinning yarn was something that could be interrupted. She began making wild yarn and “gnarly, funky hats” using huge crochet hooks Don had carved. Even tually Ashford took a class in natural dyes and learned to cook and concentrate botanical materials. 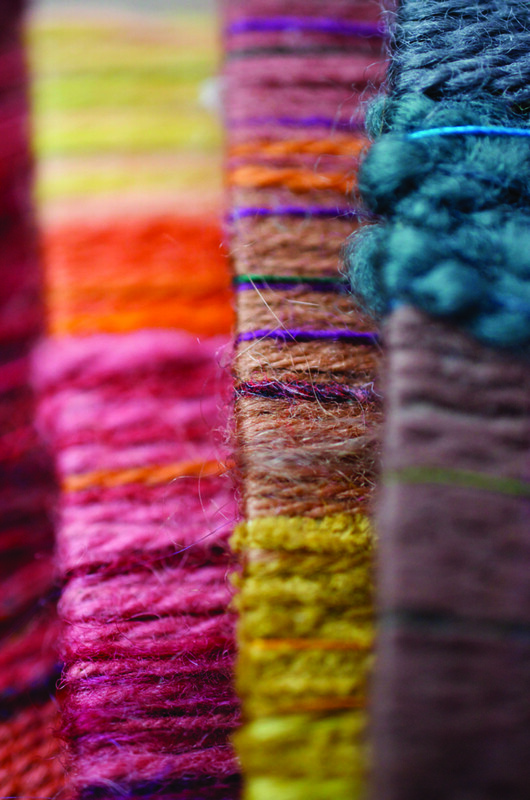 Learning about natural dyes gave her a new appreciation for color, which she used to turn her textiles into painted wall art. Ashford also began to study other techniques with textile masters from around the world. She learned a Japanese technique that uses soy milk—which she makes in a blender—to bond pigment onto fabric. While the technique was used on ancient kimonos, it can be applied to anything. “I can put pigments on the back of a jean jacket,” she said. Once the pigments cure, they never fade. “It’s pure pigment—not dye. It’s essentially fancy dirt,” she said. She makes silkscreen prints with shimmery mica. 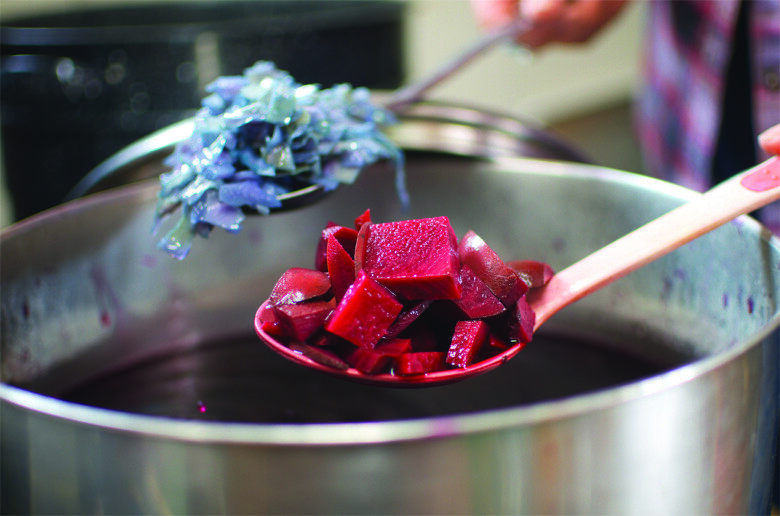 She is learning a Japanese technique that uses woodblocks to resist the dye, and recently studied a natural technique for working with indigo. Sara and Don raised five kids. In addition to the usual demands of child-rearing, they lived in the woods and often home-schooled the children. “It was definitely busy,” she said. When their son Dov became sick with leukemia at age 11, their lives completely shifted. “We were in the hospital all the time. The whole family had to pull together,” said Ashford. Dov, who suffered from complications of the disease into adulthood, died four years ago at age 29. 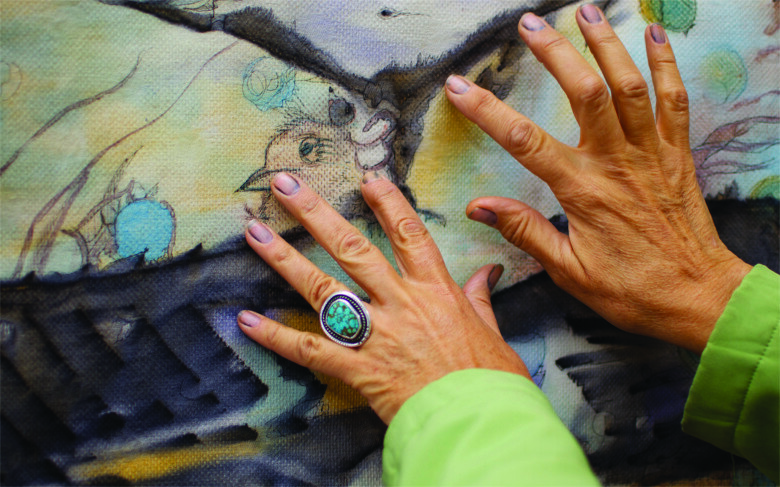 Ashford recently linked Do v’s creative talents and her art when she was preparing an exhibit of her silks in Seattle. Dov was a talented poet, and Ashford found phrases in his poetry—“Unusual Jest,” “Where Water Once Was”—that became perfect titles for her art. Two years ago Ashford was featured in a Beijing exhibit and book for her use of natural dyes, which encouraged her to focus more on the botanical sources. She is planting a dye garden this summer, where she will grow plants including weld, penstemon, edible chrysanthemum, coreopsis, hollyhocks and hops. Tender young seedlings are already sprouting by the window. Some of the flowers will be used fresh, for flower pounding and eco-prints, but most will be dried for use in the winter. 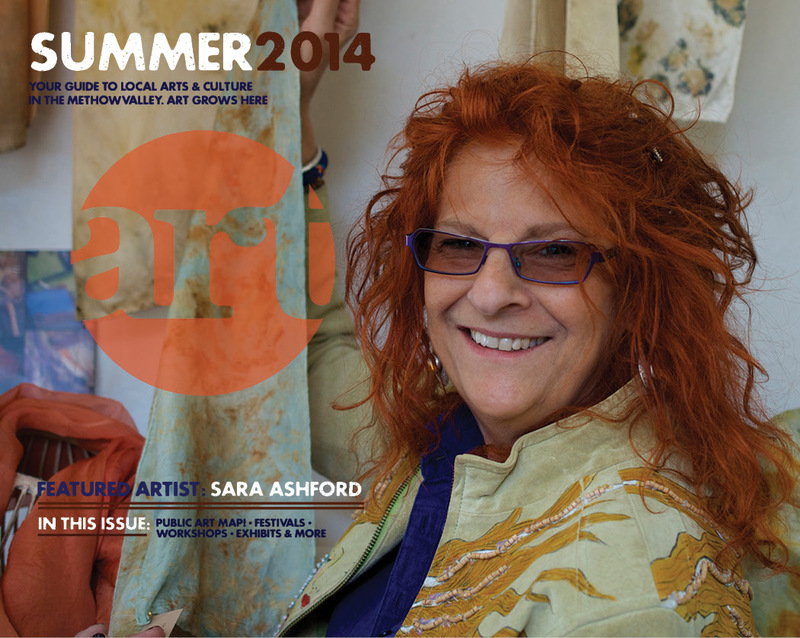 Ashford offers classes and dye workshops out of her workspace, Culler Studio, at TwispWorks.